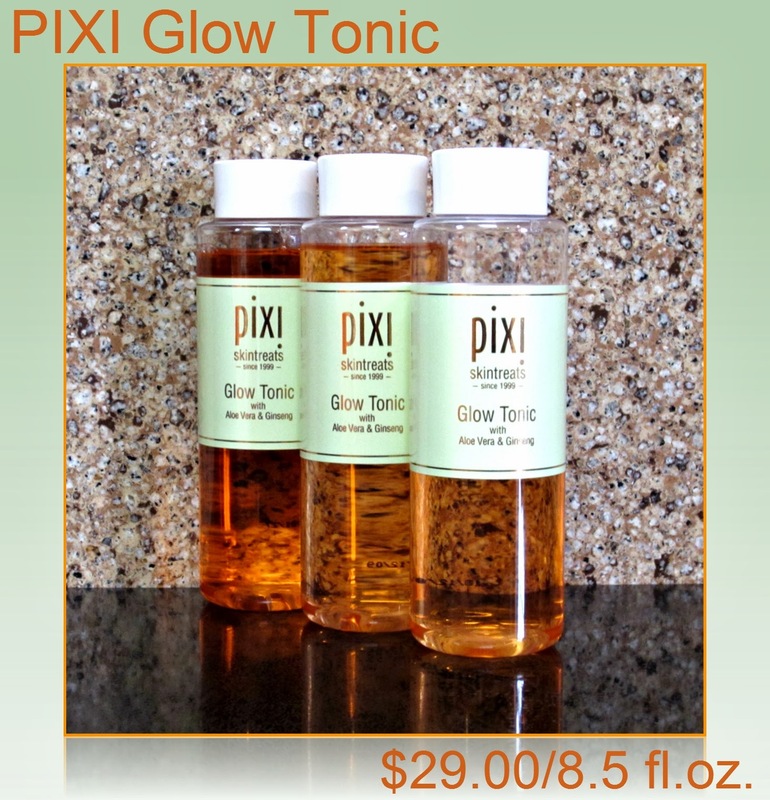 I'd heard the buzz for months about the wonders of Pixi Glow Tonic before it became available in the U.S., and when I received an eMail that it was finally in stock on the web site here, I clicked over with excitement. That excitement was short-lived though, because it sold out immediately. I took that as a sign that I really didn't need to have this magical elixir in my hands. It's not like I needed another skin care product promising things that likely wouldn't hold true. So I moved on...until I received another eMail announcing that it was back in stock. Curses. I HAD to order some! I've been using this product for about 3 weeks now, and after the second week, I wasn't going to take any more chances, so I ordered a couple of back-ups. During the first week, I will admit I was a bit irritated that I'd bought this, because 2 pimples emerged on my ordinarily clear skin. Knowing that this happens with new products, albeit rarely for me, I continued using it morning and night. The second week is when I started to notice a change in the way my skin looked. Smooth. Glowing. Luminous. Radiant. Hmm, maybe all of the hype was right! Toners, which is what I would classify this as, have never been a regular staple of my skin care routine. I'd used them religiously when I was younger, trying to combat oily skin. As I've aged, my skin is more "normal" or slightly "combination", so I haven't felt the need for a toner. Oily skin is actually a good thing to have when it comes to the aging factor, and most toners felt like they were stripping my face of oil, thereby drying it out. Glow Tonic is very gentle, and I love that it's a daily exfoliator also. It seems to add hydration, which is very welcome after this harsh Winter. There is nothing bad I can say about this rose gold coppery liquid magic potion. Is it truly magical? I wouldn't quite describe it as such I suppose, but it really is an amazing potion. Let's face it, aging is something I think we all want to keep at bay for as long as possible. At my age, dull skin, wrinkles, and all of those other good things seem to appear much quicker these days, despite my efforts to control them. This product is a real game-changer for me. My skin looks better each day...at this rate, I'll turn back the hands of time 30 years by the end of March! That's an exaggeration I'm sure, but this has been money well spent, no doubt about it. Oh, and it smells divine! I do think Pixi should consider making this in 5 gallon containers and I can start applying it all over my body! The fountain of youth has been discovered! Exfoliating facial glow tonic. It helps tone, firm and tighten the skin. It removes dead skin cells for healthier looking skin. For normal to dry, aging and sensitive skin. Alcohol free. Directions for use: Saturate a cotton pad with the tonic and sweep across face, neck and décolletage (avoiding eye area). Can be used AM and PM after cleansing. Directions for use: Saturate a cotton pad with the tonic and sweep across face, neck and décolletage (avoiding eye area). Can be used AM and PM after cleansing. Ingredients: Deionized water, Aloe Vera, Witch Hazel, Horse Chestnut Extracts, Propylene Glycol, Glycolic Acid and Ammonium Glycolate, Hexylene Glycol, Glucose, Fructose, Sucrose, Urea Dextrin, Alanine, Glutamic Acid, Hexylnicotinate, Ginseng Extract, Potassium Alum, Diazolidinyl Urea, Biotin, pixi Natural Fragrant Oil. Active ingredients: Glycolic Acid-5%, partially neutralized by Ammonium Hydroxide. 8.5 fl.oz.